Flip-it! 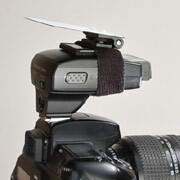 400 Mount & Store - Demb Flash Products - Diffuser, Flip-it! Mount the Flip-it! 400 by slipping the velstretch strap around the flash, making sure the reflector lines up with the flash, as shown in the illustration. 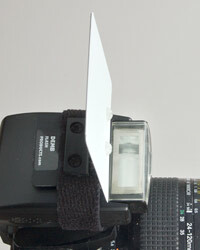 Flip the reflector back all the way for direct flash or ceiling bounce without modification. This illustration shows the soft velstretch strap, which holds the Flip-it! 400 securely on your flash. 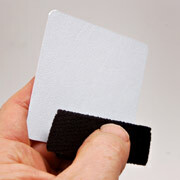 Folds small to fit easily in your camera bag or purse. For information about how to set the reflector, go here.